Used 2012 CIH 330 Turbo True-Tandem 25-foot vertical till, tandem axle on main and wing frames, front wing gang swivel gauge wheels, C-spring cushion gangs with all new front/rear gang blades, rear rolling basket, transport light package. Serviced through shop. Sharp unit; field ready. Used Krause 3950 21-foot disk, C-spring cushion gangs, original blades measuring 21½", disk scrapers, transport light kit, rear jack stand, Krause 3-bar mounted harrow. One owner; low acres; like-new disk. Used Schulte RSH4 rock picker, conveyor chain pickup, new bearings just installed in both chain idler sprockets. Serviced through shop; good condition. Could use paint. Wil-Rich 3420 41½ field cultivator, 13-foot main frame, 71 shanks, 5 section fold, 7" K/O shovels, four-bar Wil-Rich coil tine harrow, walking tandem axle on main frame and inner wing frames, crank-adjustable single wheel on each outer wing. Good shovels & harrow teeth. Cultivator and harrow can be reduced down to 35'7". White 435 8 shank disc chisel plow, eight concave cutter blades, hydraulic lift cylinder with hydraulic depth stop, walking tandem axles, new twist shovels, original blades like new condition. This 435 can be expanded to 12 shank, 12' disc chisel plow. Serviced through shop and field ready. Used John Deere 230 26-foot disk, cone blades, 9" spacing, front blades 19"+, rear blades 20"+, like new tires. Serviced through shop. Clean, straight disk. Used White 273 12' disk (center frame without wings), center coil attachment, front blades measure 19", rear blades measure 20", good scrapers. Price does not include wing fold cylinders shown in photos. Note: This disk was originally a 25'0" disk with 9" blade spacings. We have several good parts from wing frames for sale, including cushion gang C-springs, full and 1/2 spools, gang shafts, wing rock shafts etc. Call with your needs. 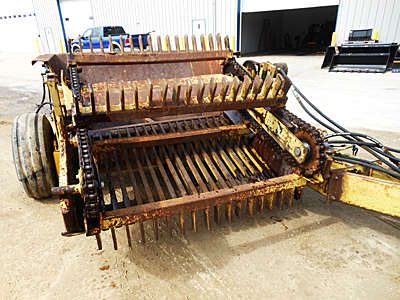 Used IH 490 disk, 21-foot width, blades measure approximately 19", good scrapers, three cylinders with hoses. IH 720 5 bottom furrow plow, spring reset, coulters, lift cylinder with hoses, gauge wheel, Cat III hitch bar, excellent moldboards and coulters. Serviced through shop. Wil-Rich 13FCW 30' field cultivator (52 shanks), knock-on shovels, walking tandems on main frame, singles on wing frames, 4-bar Wil-Rich harrow (harrow needs some work). All shanks are good and tight. Size of cultivator can be reduced to 24' or ?? Has rear tow hitch. Used Kewanee 610 12-foot disk, dual wheels, hydraulic cylinder with hoses, blades measure 19" on front, 20" on rear, good scrapers, greasable gang bearings. Very straight, clean, heavy duty disk. Serviced through shop. Used White 378 8RN non-folding 30" row crop cultivator, heavy duty Danish tines, two stabilizer coulters. White 508 4-bottom plow, SAR, with cylinder and hoses, adjustable 16" to 18". No welds; clean, straight plow. Spring cushion coulters, new landslides. Used International 645 "Vibra Chisel" chisel plow, 12 spring cushion shanks with reversible double points, cylinder with hoses. Good, tight, low-usage chisel plow. Used Cook Model 10 10-shank chisel plow with spring cushion shanks, twist shovels (less cylinder and hoses), implement tires. Serviced through shop and field ready. Used Kewanee Model 140 18-foot disk, manual fold wings, 7½" blade spacing, front blades measure 18½", rear blades measure 19½", dual wheels on main fame, hydraulic cylinder with hoses (disk measures approximately 11 feet if wings are folded up or removed), disk has two broken blades; needs minor repair; selling as is. 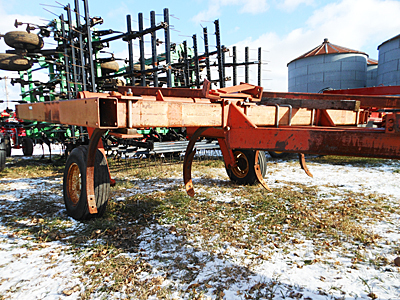 Melroe 5-section coil-tine harrow on transport cart, 27 foot width (three 5-foot sections and two 6-foot sections), good teeth, original paint. One owner; very good condition. Minneapolis Moline 10' disk, adjustable gang angle with hydraulic cylinder. Needs some work. Hard to find size. Collector item. Parting out White 435 9-shank disk chisel plow with rigid shanks. Good condition. Remaining salvage parts: 9 shank main frame, rock shaft, rigid shanks, tool bar for cutter discs.